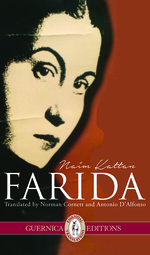 In a recent radio interview on The Zelda Young Show, Professor Norman Cornett speaks about Naim Kattan’s Farida. He elaborates on the life and writing of Naim Kattan, on the thematic concerns of the novel, and on literature’s ability to makes readers aware of issues and realities which pertain to culture and identity. The English translation of Farida by Naim Kattan trans. Prof. Norman Cornett and Antonio D’Alfonso was published by Guernica Editions in 2015. Cornett explains that he met Naim Kattan in his dialogic sessions, and that he was pulled to translate Farida into English in order to bring a vision of a different reality of Iraqi history to an English readership. Furthermore, Cornett speaks about Farida’s central figure, a Jewish songstress who is significant in setting up this alternate vision of Iraq in the novel. Cornett points out that the vision of Iraq portrayed in Farida relates to Kattan’s own experience as an Iraqi-Jew. He goes on to stress the significance of Naim Kattan’s novel in education, and its ability to bring awareness to students. Cornett stresses that, despite the fact that Kattan’s book is a work of fiction, it is capable of making readers aware of historical reality. He further explains how this relates to the reality of creative writing, which is a task that takes much productivity, much more discipline, than pure inspiration. Tagged with Antonio D'Alfonso, CHIN Radio, Farida, Interview, Naim Kattan, Norman Cornett, The Zelda Young Show, translation.